Crystal Cruises is the world’s leading luxury cruise provider, having earned more “World’s Best” awards than any other cruise line, hotel, or resort in history. Crystal Cruises was created in 1988 with a vision to set a completely new standard in luxury travel and world exploration. Crystal Harmony, the first ship debuted in 1990 remembered for its tremendously spacious public areas reminiscent of grand ballrooms, lavish casinos and splendid dining rooms. Crystal Harmony was retired in 2005. Today, Crystal Cruises operates the two top-rated luxury ships in the world: the 922-guest Crystal Symphony (launched in 1995) and the 1,070-guest Crystal Serenity (launched in 2003). Crystal is wholly owned by Nippon Yusen Kaisha (NYK), one of the largest shipping company in the world. Headquartered in Tokyo, the firm operates over 800 ships. Crystal Cruises Is “Editors’ Choice” In 2014 Bon Voyage Awards also. New “Crystal Casual” – A dressed-up version of casual attire, the new designation for evenings applies to all areas of the ships after 6 p.m. and includes dresses, skirts, dressy slacks and blouses or sweaters for women, and dress shirts and sport coats (no tie required), open-collar or collared polo shirt and dress pants/smart trousers for men. Black Tie Optional – More formal evenings boast the celebratory ambiance of a special occasion, calling for dark suits with ties or tuxedos for men and formal cocktail or evening dresses, or formal evening separates for women. 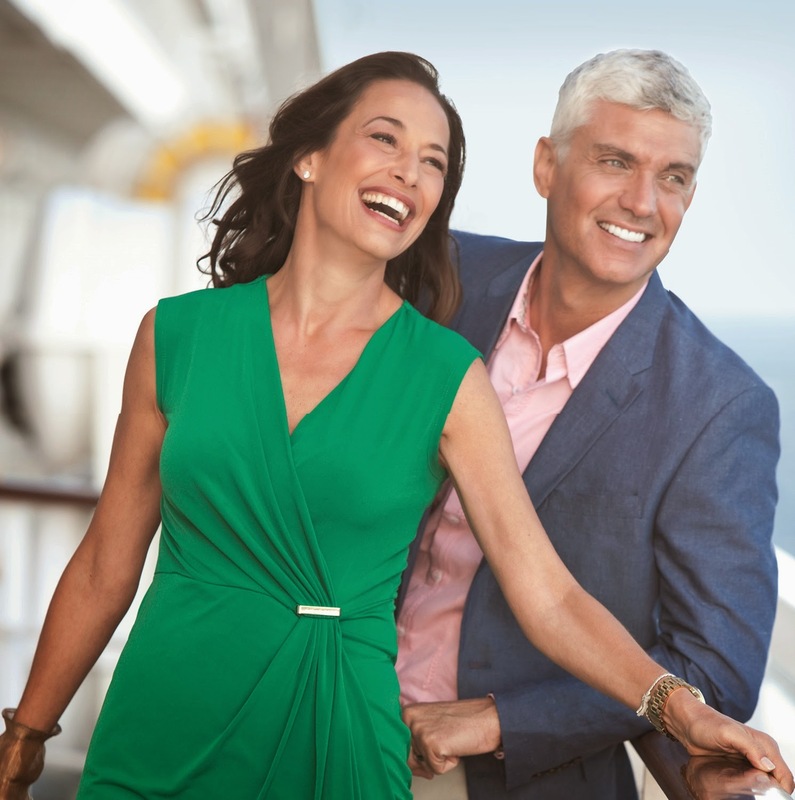 With the new evening dress code policy, guests can expect one “Black Tie Optional” for seven- to 10-day cruises, and two on 11- to 13-day cruises. These estimates are subject to change depending on itinerary details, while World Cruise, Holiday sailings and ocean crossings may be scheduled differently. The new guidelines do not apply to daytime hours, when guests are encouraged to dress comfortably and appropriately for their chosen activities. Crystal Dining Room attire is casual during the day, and those not wishing to change ensembles for evening dining may opt for dining on the ships’ spacious indoor/outdoor Lido decks. On Black Tie Optional evenings, jeans are not allowed in any dining venues or lounges, including the Crystal Casino. Until 31 October, all-inclusive, value-priced “Book Now” fares start at just $1,400/person, double occupancy. 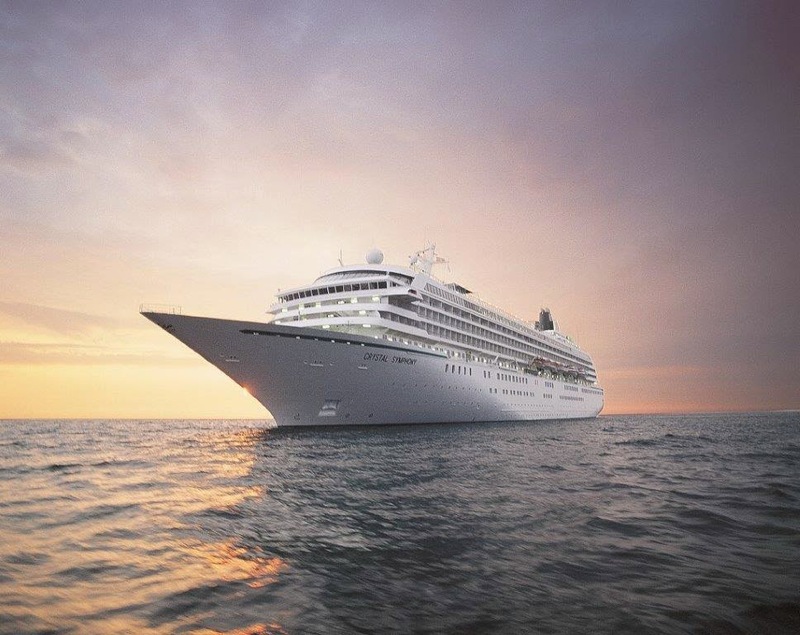 Aboard the all-inclusive, ultra-luxurious Crystal Symphony and Crystal Serenity, refined elegance meets casual simplicity. With an emphasis on innovative product differentiation, the renowned Crystal experience is distinguished by classic service, abundant space, superior quality and extensive choices. Crystal sails to all seven continents, providing worldwide vacations of five to 100+ days that bridge the best of land and sea. I have never been on a cruise till now in my life but after working through Crystal Cruises website and other social media channels, I really want to pack my bags and go on a trip asap. For more information and Crystal reservations, contact your travel agent or Cruises International on 011 327 0327 / reservations@cruises.co.za. Check their website Follow them on twitter & facebook. A Most Wanted Man (2014) is a thriller movie set up in Germany and is based on the novel with the same name written by John le Carre. The film stars Philip Seymour Hoffman, Rachel McAdams, Willem Dafoe, Robin Wright, Grigoriy Dobrygin, Daniel Brühl and Nina Hoss. 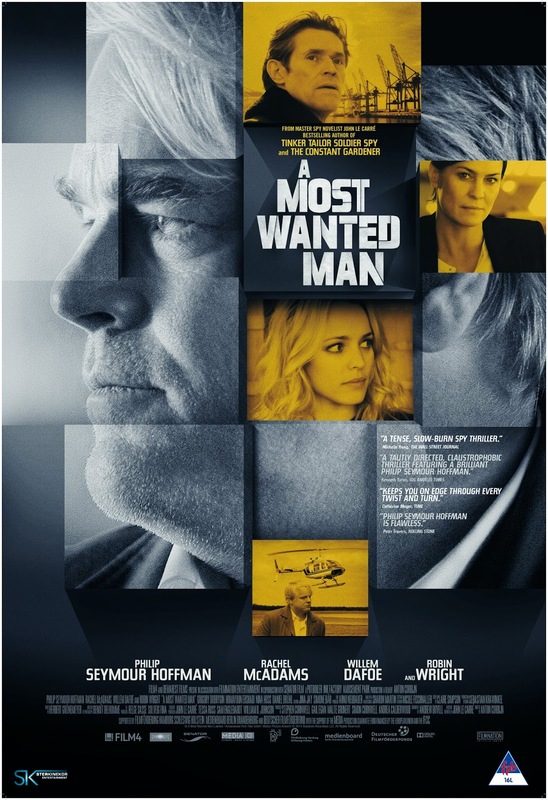 This is the last movie of Philip Seymour Hoffman as the main lead actor before his death this year. The movie is a story about a German espionage agent who works to get the details about a sleeper cell being operated in Hamburg, Germany. He fights the forces from USA Diplomats for his continuous efforts to catch the Islamic extremists. Rachel McAdams looked great in her role as a lawyer along with Robin Wright as a US Diplomat. It was so nice to see Robin Wright after seeing the two seasons of The House of Cards. Her voice quality creates an aura and mystery which brings a lot of niche in all her roles. Her voice really suited this character as a US Diplomat very much. Hoffman is the key to this whole movie along with Grigoriy Dobrygin who is the primary context of the movie. The movie will keep you involved as the mystery continues to deepen and evolve with every passing minute. Willem Dafoe has acted well in his role as the head of a Private bank. Overall this is the type of movie you will like to watch if you like suspense thrillers with Bond (spy) kind of story without any action though. The movie has a lot of run and chase scenes and what gets into collecting the information about sleeper cells is shown. The movie is directed by Anton Corbijn who also directed The American (George Clooney) earlier in 2010. Movie is releasing in Ster Kinekor on 24th Oct 2014. Book your tickets now. More info on twitter and facebook. 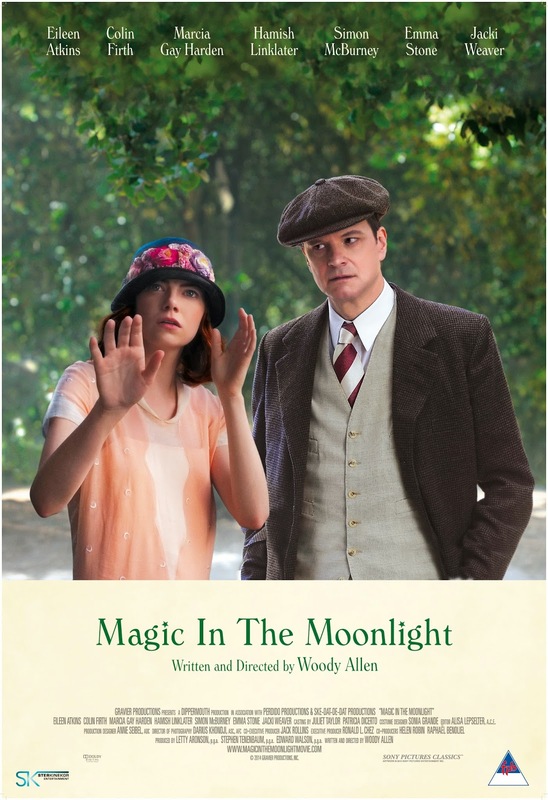 Magic in the Moonlight (2014) is a Woody Allen's romantic comedy movie set in 1920s in France. The movie stars Colin Firth, Emma Stone, Eileen Arkins, Marcia Gay Harden, Hamish Linklater, Simon McBurney and Jacki Weaver. The movie location is awesomely good and cinematography is great. Emma Stone looked beautiful in 1920s clothing and so did Colin Firth. The movie shows some of the great views of French Riviera. He keeps on speaking in this movie and largely this movie is based on conversations between him and other characters. The humor is in the dialogues as well as the expressions of the actors. This is something that will evolve with you as you are left astonished to what is happening on the screen between the main characters. Magic in the Moonlight is a very nice romantic lighthearted movie which you won't want to miss at all in theaters. Colin Firth character is a magician in the movie and comes to help one rich family uncover clairvoyant and mystic Emma Stone as she tries to dupe them with her mother on the request of a family member who is against Emma's character falling in love with his brother. In the process of finding the truth, a lot of funny and romantic moments got created between the lead actors. This is a movie which will keep you involved in the story and conversations. The story has an added mystery to the whole setup which is revealed in the end. Overall it's a must watch with your loved and dear ones. Go for it! Movie is releasing in Ster Kinekor on 24th Oct 2014. Book your tickets now. More info on twitter and facebook. Check facebook page of Sony Movies SA & their twitter handle also. October 2013 during this time last year, I was busy in my VISA application for South Africa and also busy promoting my blog (www.thelifesway.com) to get to maximum brands and blog for them. 1. Product Launch - LG G2 #Great2Haveyou 30 Sep 2013 - I got invited to launch event for the launch of LG G2 mobile phone from one of their PR's. The phone looked awesome and the goodie bag had great things I liked and always wanted. Though I didn't got any devices to review but it was great to be in their launch event at Kingdom of Dreams, Gurgaon. 2. Product Launch - Gionee ELIFE E6 Smartphone - Another invite from one of the famous PR's of Gionee mobile where I got to see Huma Qureshi also. It was a great event where I got to see Rajiv Makhni live in action and discussing on gadgets. The phone looked awesome but never reviewed the device till now. 3. NIKON #ThroughTheLens Blogger Meet Delhi 19 Oct 2013 - Another awesome invite was from the company whom I loved the most and wanted to have their DSLR from so long. They launched D610 & D5300 in India and called some of the bloggers for the same. I got some Nikon goodies (4gb SD card/ DSLR strap & Nikon Tshirt) which I knew will bring me DSLR sooner or later and now I am the proud owner of D7000 but bought it myself. 4. Amazon.in - Light up a child's Diwali - One of the donation of books drive which was close to my heart. After listening to someone on TEDx talks regarding non-availability of books to a lot of kids, I thought of donating some books and I felt great after sending kids some books worth Rs. 3500. I don't know how much kids are happy but I hope they celebrated their Diwali with new books from Amazon. 5. Indiblogger DID4 Meet - #DanceItOut for Women Security - My last Indiblogger & Zee TV meet in Delhi that year and I really loved to be a part of the same. It was during the meet only I got the email that my VISA has arrived and I need to travel soon to South Africa. I travel on the day before Diwali and spent the festival in the new country all alone in a room. Life is full of ups and downs and I won Sennheiser HD202 headphones for this post and I was very happy because I always wanted to have them. Thanks to Indiblogger for all the love and gifts in the last year. November 2013 - I didn't do any posts because I didn't had any internet connection with me and was only using data on mobile. It was a break from always online habit for a while and I really loved the same. Though it was very very difficult to stay away from internet but I could do it successfully. The year was awesome till the time I was in India as I made my blog grew along with me and over the journey won a lot of gifts from blogging as well as twitter. Twitter contests consumed a lot of time and efforts and the rewards was sometimes not much worth but the adrenaline to win is awesome.You can't stay away if you get into the habit of winning on twitter. Try it out! Gorgeous, glowing skin isn't all about creams and makeup. Nourishing your body from the inside can have fantastic results for anyone wanting a clear complexion, especially those who suffer from eczema. This common skin condition means itchy, dry skin, and can affect people of all ages, especially during stressful periods. The good news is that those with eczema don't have to scratch and suffer in silence. Research has shown that certain nutritional supplements can deliver healing vitamins, minerals and antioxidants to the skin, making it softer and more supple. Vitamin A and vitamin C (especially in combination with bioflavonoids) strengthen the skin, and vitamin E and zinc can help to improve healing. Both omega 3 and 6 fatty acids are also beneficial. The challenge is to incorporate all these elements into a diet on a regular basis, particularly for those who live a fast-paced lifestyle with limited time to prepare complicated meals. This is why Solgar has developed a range of supplements that boost skin health and prevent eczema attacks – which is both convenient and 100% natural. Solgar's Skin, Nails and Hair contains a combination carefully researched and specifically tailored nutrients. "The skin is the largest organ in your body and needs to be given a lot of attention," says says Dr Rowena Thomson of Solgar South Africa. "While creams and lotions feel like they are providing moisture, they tend to only address the symptoms rather than the cause. A nutritional approach can help stop eczema and nurture your skin for long-term results and a fresh, beautiful skin tone." She adds that it is important to consult with a healthcare professional in the case of young children, however. We have already spent thousands of rands on buying various beauty products. All the shops in any general shopping mall will be selling thousands of organic & non-organic creams and lotions. It's time to try something which says that it will be beneficial for our health and skin. Looking forward to getting the samples of Solgar's various products asap so as to confirm their beliefs. Addicted2Life is a program to empower young people to make the right decisions about Drugs and substance abuse. It's an initiative between Cinema Park and Gauteng Department of Education to directly engage with learners from various schools around Gauteng to make them aware about the substance abuse and drugs. The program hopes to reach more than 12000 Gauteng learners from Grade 7-12 over the next few years. The movie takes learners up to six different experiences that every parent and educator can use to give children the tools to better deal with the difficult decisions they will have to make as teenagers and young adults related to drugs, alcohol and substance abuse. The war against drugs starts with you and you only. The movie shows the impacts of drugs and alcohol on the physical and emotional side of human beings. This movie will help make learners aware about what it is really like (in your body, mind and life) after you use these drugs. Addicted to life program honestly presents the facts about drugs and alcohol. 1. The Interactive Experience - "Your Choice" - A series of questions are asked to every learners and their inputs are recorded using the unique personal remote control. The questions tests the understanding, knowledge and attitude of learners before and after the program. The top 3 learners after the final round wins some rad prizes from Cinema Park also. 2. The 3D Experience - "Feeling the Chemistry" - Youth generally tend to believe that they are immune to the dangers of addiction. They wrongly suppose that whoever isn't addicted surely won't be harmed and they themselves won't become addicted ever. They have strong will power etc etc. These myths are broken in this video presentation which shows that once a drug abuse stays in your body for more than 30 days. It affects your heart and brain as well as other parts of body. 3. The Darkness Experience - "Knock Out" - The lights are switched off and learners are taken to a role play kind of journey of 3 youngsters at a party via audio inputs. The party ends in tragic circumstances. The learners learn how social pressures can change one's mind and affects negatively on one's decision making process. You could feel as to how will you react in that particular situation. 4. The Motion Experience - "Chain Reaction" - Another movie presentation that takes learners through the process of drug making across the world. The movie shows the harsh realities from growing the plants to processing the same and finally transporting it through various parts of the world. It all leads to a big network of crime which is worth billions of dollars. It not only affects the end user but also the creator of the same too. 5. The Inspiration Experience - "Reality Check" - This is a movie presentation to take learners through the dangers of alcohol. It breaks various misconceptions that alcohol only damages in the long run. The truth is that even one occasion of irresponsible drinking can have devastating effects. The movies shows various real life examples of individuals/families which are suffering due to the same. Overall, it's a journey which will make you aware about the drugs and it's effects on your body, brain and life. It not only vanishes your life but also your friends & families. Do check this program out to learn & experience for yourself before you take that path of no return. I don't do alcohol or any other substance abuse but it was a great learning experience for me too. I didn't know what drugs and alcohol causes inside your body and how it impacts your families and friends? I would like Cinema Park to include questions related to whether learners have taken theft as a measure to purchase drugs or if they are doing it already so that crime in our own lives angle & discussion can also be showcased. Addicted2Life is available in Ster Kinekor. More info on twitter and facebook. It was very late by the time Jennifer finished reading all the files and reports. She looked at her watch. 02:35 AM. She had another 5 hours before her meeting with the team. She decided to make maximum use of her time and crawled into her bed. Her sleep was interrupted by the phone call from Tara. “Alright, we’ll see you soon then.” said Tara and disconnected the call. Jennifer reached the temple office. She apologized for her delay in reaching the meeting. Tara and Shekhar’s faces lit up with recognition. That was exactly what Jennifer was looking for. “We know an Aryan Ahuja back in Mumbai.” Said Shekhar. Jennifer gave a look of warning to Shekhar. “Yes, the very same. He is our neighbour. It never crossed my mind till now that he could be of some use to us. Thanks Jayalakshmi and if all of you agree, we can talk to him right away”, said Tara. “So, I will have to go with the idol to Mumbai.” Sudheeran said more to himself than to the team. Jennifer expressed her interest in the assignment. She had so many questions. She had to be there in person to listen to what Aryan Ahuja had to reveal about the idol. “I think it is my family temple and idol we are talking about. I do not want outsiders telling me what to do and what not to do. Whether you like it or not Mrs. Dutta, someone responsible among us will definitely look into the testing of the idol. If that means I have to go, I will.” Jennifer noticed that Sudheeran was finding it very difficult to keep his calm. The police officer reminded Sudheeran that the procession was scheduled for the next month and it wouldn’t look good if he left Vajrakshipuram. Besides, all the official sanctions required his signature. The officer said that he would accompany the team. It would only look like an official visit to Mumbai. Finally, Sudheeran agreed, “But Mr. Dutta and the child cannot step out of Vajrakshipuram. He is still a suspect and the child is the chosen one.” He looked at Tara and Jennifer. Though Tara had stayed away from Roohi for her official tours, this time she was finding it very difficult to leave her and Shekhar in an unknown place among unknown people. She asked him to keep Roohi close. The chosen team left the same day for Kochi and took the evening flight to Mumbai. On arriving in Mumbai, Tara called up Aryan requesting him to spare some of his time for them. He said that they could visit him early the next morning at his shop as he received his regular customers only later in the day. Aryan’s shop stood out among the other stores lining the street. It looked like a place where the who’s who of Mumbai would shop to decorate their homes. Bronze and copper statues adorned the glass windows. The whole shop was air-conditioned and the counter was right in the end where Aryan used to sit on his plush leather chair. The section close to his counter contained all the precious metal antiques and silverware. Aryan had an excellent security system in place and there was always a guard and a store attendant standing near the gates to guide customers inside the shop. “Hi, I am Ravi”, the inspector introduced himself holding his hand out for Aryan. “Ofcourse Ravi.It would be a pleasure to help you out!” Aryan replied while returning the introductory handshake. They handed him the idol. He looked at it closely and said. “Hmm... Fair enough.” He looked at the idol for a while longer. Saying so, he took them into a dark room. There were a couple of men working. He walked into his office. He applied a gel behind the idol and turned on an instrument. The instrument had a screen and a probe light was attached to it using a thin cable. He placed the probe light on one end of the idol and began moving it gradually to the other end. As he progressed, he looked into the screen and his mouth curved with the promise of a smile on it. He switched off the instrument. He passed the idol through another instrument. After that, he placed it on the table. “Well Mr. –”, he looked at the officer. “Of course! That is possible.” He picked up the idol and looked at it. “What kind of setup is required to weld this small idol”, asked Tara. Tara felt that someone who knew the idol too well & was an absolute master mind was behind the forging of the idol. He not only had a wide knowledge about metals, but he had also done his homework very well. The maker either had direct access to the idol’s features. Or someone from inside the temple helped him with the exact details of the idol. She knew he was within her reach. But who was he? Follow us Facebook for the next chapters: Click here. The artichoke is one of the oldest cultivated plants in the world, with Ancient Egyptian texts showing that artichokes have been used medicinally, as well as for food, for thousands of years. It was considered a rare and noble plant, and was highly prized as something available only to royals and the elite. Artichokes contain a wealth of health-giving nutrients and active ingredients that can be used to protect vital organs and systems in your body, such as the liver and digestive system. It also has a role to play in heart health, due to its cholesterol lowering properties. Luckily, with Solgar’s Artichoke Leaf Extract, you don’t have to be a member of the royal family to reap the benefits of this amazing plant. So what makes this humble veggie such a superfood? Apart from containing vitamins C and B, folic acid and potassium, the artichoke contains the active ingredient cynarin, found mainly in the leaves. Cynarin promotes liver function, supports the digestive system to function properly and can play a role in lowering cholesterol. The liver is one of the hardest-working organs in the body, and is essential to filter out toxins from everything we eat and drink, removing chemicals like medication and alcohol from the blood, regulating hormones and blood sugar, and making certain compounds which the body needs. It is thus easy to see why taking care of the liver is vital for good overall health and well-being. 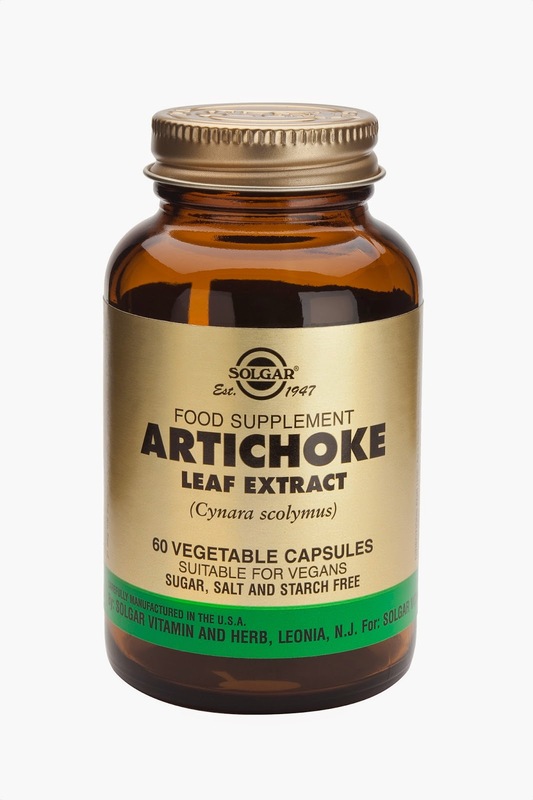 Cynarin from artichokes is an all-natural way to ensure that the liver is able to work optimally and keep you in peak condition. We all need multivitamin tablets and other necessary things from time to time. Because of our stressful and busy lives, our food is not able to provide us with the necessary sources of energy and then we need to take these tablets to cover for our well being. Clicks/Boots/Dischem all have their own cheaper versions of medicines as well as some branded ones (Amway's Nutrilite). Solgar is one of these brands that gives you value for money products. These tablets are food supplements and doesn't take the place of the real fresh cooked food, veggies and fruits.